Why has it taken so long for something from 21st Amendment to earn this blogs “Beer of the Month”? I’ve long been a fan of this brewery, so one of life’s minor mysteries has been rectified as 21st Amendment’s Fireside Chat takes this month’s honors. What can I say about this beer? 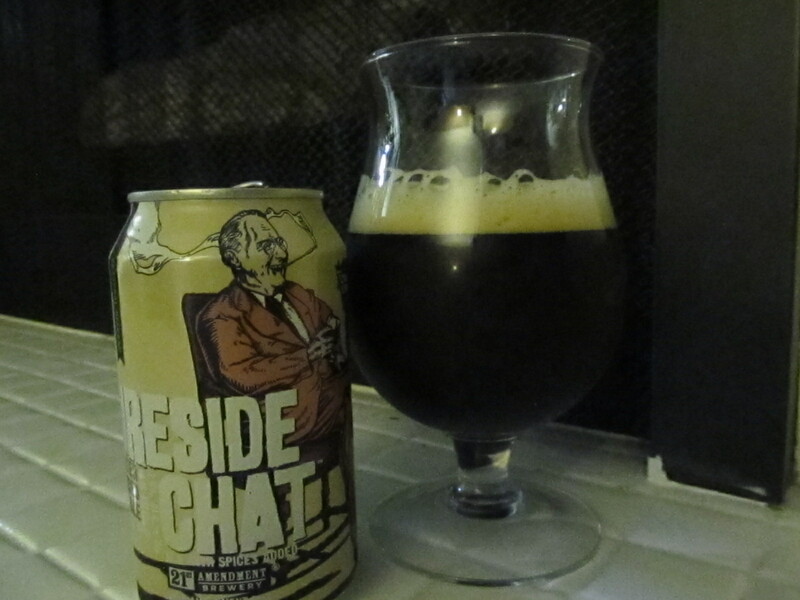 First, you got to love the can art which depicts FDR sitting by the fireplace chatting jovially with a holiday elf. The beer itself has this great ruby brown color and sturdy, sticky head to it, hitting most of the visually aesthetic points if you’re in to that sort of thing. But my favorite attribute about this beer is that it tastes “wintery” in an obvious, yet undefinable way. At least what I taste is a strong, slightly nutty ale with cinnamon, some nutmeg, and some other spices. 21st Amendment uses cocoa nibbs which I didn’t pick up at first taste, but I believe provides the earthy, nutty note to the brew. Magnum and Goldings hops give it 45 ibu’s, but it just doesn’t seem that bitter, with the hefty amount of malt seeming keeping it in check. At 7.9% abv, it’s more drinkable than of lot of winter warmers, almost quasi-sessional in a “have a couple in an evening and still be standing upright” sort of way. Which I think is the best thing about Fireside Chat. Do we need another monster Holiday Ale, checking in at 12% abv, brewed with Frankincense, Candy Cane Sugar, and Reindeer Must? I think not. Well…after this review I suppose I should pick some up! Sounds like a winner. Thanks for the review.